WHOLE LOTTA LOVE FOR EYEHATEGOD! The Copenhagen-NOLA Connection is loose! Our loopy pal in Denmark, JENS HELLROUTE, recently met up with the long-running masters of miserable sludge metal, Louisiana's own EYEHATEGOD! Over a mountain of empty bottles, Jens touched base with MIKE WILLIAMS, JIMMY BOWER, BRIAN PATTON and GARY MADER. 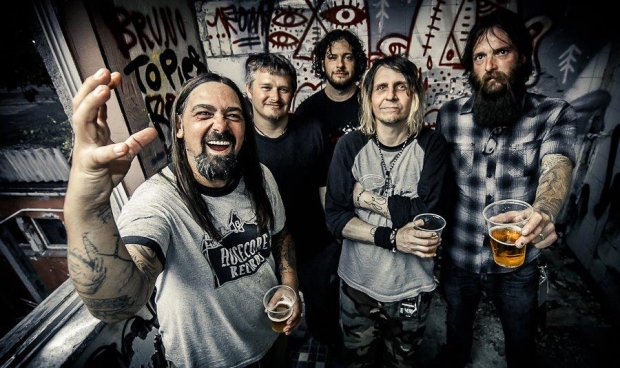 We find out about what the guys think of the government's response to Hurricane Katrina (it ain't pretty), the public perception of Eyehategod vs. the reality, and the band's love of Denmark. Plus some new tidbits about the upcoming EHG album and more! Check out this toxic talkfest HERE! On a sad note, the interview was conducted just before the tragic death of drummer JOEY LACAZE! R.I.P., Joey! In other news, I confirm a brief but potent interview with haunting doom-lords WINDHAND! I'm also doing a tribute to the late JERRY G. BISHOP, who gained fame as the hippest horror host in history, the original SVENGOOLIE! Plus PELICAN, HAVOK, RAZORMAZE and more! Working on a couple of special projects as well. ZUD "The Good, The Bad & The Damned"
FUELED BY FIRE "Trapped In Perdition"
CHURCH OF VOID "Dead Rising"
42 DECIBEL "Hard Rock and Roll"